From the time the calendar rolls from December to January, we have World of Concrete on the brain. As the largest show we attend each year, it gives us the chance to use many tools that we’ll put through a full review later in the year. Narrowing down our list to the top 10 best tools at World of Concrete 2019 is about as tough as picking the top 10 fans that don’t want to see the Patriots win another Super Bowl. Fortunately, we’re up to the task. Makita may well have the perfect balance of compact design, features, and performance with their new XDT16 brushless impact driver. It sports 1600 in-lbs of torque, 4 standard speed modes, 4 optimized modes, and a programmable mode switch button. All that and it comes in an incredibly lightweight and compact package. I’ve been waiting to make some cuts with Skilsaw’s new worm drive miter saw and this thing is smoother than any belt drive model I’ve used. 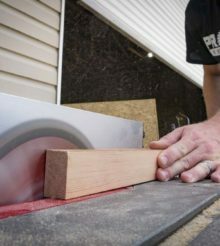 It has all the bells and whistles it needs to compete with other premium dual bevel sliding miter saws out there. It also happens to be the lightest in its class at 51 pounds. Bosch X-Lock grinders and wheels will change the way to you swap grinder wheels. It’s a completely tool-free system – just pull a lever in front of the motor and the wheels is free. The new wheel locks in place with an audible click and you’re ready to get back at it. No more searching for lost spanner wrenches and holding a wheel lock button down. By putting a new hammer unit in their 2nd generation FlexVolt SDS-Max rotary hammer, DeWalt is now getting 19.4 Joules of impact energy and pushing their hammer to the 2″ level. It’s the most powerful in the cordless sector so far with an optimal range of 7/8″ to 1-7/8″. U.S. Saws combines ingenuity and precision to convert a Metabo grinder into a core drill. For core drilling up to 10″, it’s a brilliant solution that holds onto the core, making horizontal and vertical cores easier to deal with. OLFA is giving their industry-leading blades a more durable aluminum housing to improve their durability on the jobsite. The new knives come in two flavors – a slide auto-lock and a ratchet lock. For now, they’ll stick with their popular 18 mm size and will come pre-loaded with black blades. The Flex GE-7 Giraffe Drywall Sander is the world’s first to have an interchangeable head system. With push-button release, you can swap between round, edge, and orbital heads. As a bonus, they moved the motor into the handle so there’s less weight fatiguing your arms out away from your body. If you’re ready for a wall saw without the e-box, check out Hilti’s new DST 20-CA. Using the wireless remote control, you punch in the information and the saw does the rest, including managing the speed, gear, and water flow. Just be prepared to open your wallet – they start at $54,000 each. One of the top names in levels is bringing their considerable talent to make a digital angle finder. The Tech 700 DA can measure and transfer angles, function as a digital spirit level, and act as a bevel gauge. You can even lock the angle in and use it as a circular saw guide. This IP54 rated angle finder has a maximum angle range of 270º and 0.10º digital accuracy. Fall protection is critical to the safety of your employees and keeping OSHA inspectors off your back. Werner’s Max Patrol self-retracting lifeline is all about keeping you safe on leading edges with a design that gives you free movement at height and a shock pack that gives it approval for steel beam, precast concrete, and B-deck leading edges along with non-leading edges. That’s our Top 10 Best Tools at World of Concrete 2019. Did you see something from the show that we should have included? Tell us about it in the comments below!